You will hear from your parents when you first get your license, you'll hear it from the person you buy your car from and you'll hear it right here. Scheduled auto maintenance is important, never forget to have it completed! Car's can't last forever, but you can extend the life of the engine, transmission and all of its other components as long as you keep up with factory scheduled services. So what does scheduled auto maintenance entail? When a vehicle is being designed the engineers must take into account what sort of wear and tear each part will suffer from. As testing goes on they will design a service schedule for your car that will be printed inside the owner's manual. This way you can keep up with all types of scheduled services to ensure your car continues to run great. The following are some of the most common types of factory maintenance. 30/60/90K Service - Many services required by your car are needed every 30,000 miles. 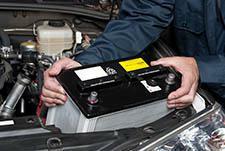 These services include safety checks, computer diagnostics, battery service, transmission service and more. Oil Change - The most frequent service your vehicle will require is the oil change. This service ensures proper lubrication for the moving parts of the motor. Timing Belt - If you do not have the timing belt changed on time there is a good chance that you will be facing expensive engine repair in the near future. This service is usually needed between 75,000 and 105,000 miles. Fluid Services - All vehicles use several types of specialized fluids to operate their various systems. At certain mileage points these fluids need to be drained and refilled, called flushing, to ensure they are free of any damaging contaminants. Why do I need to do this for my car? Factory auto maintenance saves you money while keeping your car healthy. If these services are not performed your car will eventually break down. This means you're going to need to call a tow truck and fork over cash for a repair that is definitely going to cost a lot more than what the simple maintenance would have. Never put off scheduled auto maintenance! To scheduled factory auto maintenance in Asheville, NC, visit the pros at The Organic Mechanic. We strive to provide fast and affordable auto services for all makes and models. To learn more about our services or to make an appointment for quality auto maintenance in Asheville don't hesitate to contact our team by calling (828) 232-8120 today.